ANOTHER WOMAN HAS stepped forward to accuse former US President George HW Bush of inappropriately touching her. Roslyn Corrigan told Time magazine that she was 16 when Bush grabbed her buttocks as she posed for a photo with him in 2003 at a gathering of CIA officers north of Houston. She attended the event with her mother and father, who was an intelligence analyst. “My initial action was absolute horror. I was really, really confused,” she told the magazine. A spokesman for the 41st president, Jim McGrath, said in a statement today that Bush regrets any offensive actions. “George Bush simply does not have it in his heart to knowingly cause anyone distress, and he again apologises to anyone he offended during a photo op,” he said. The stories came to light after television actress Heather Lind said last month that Bush, now 93, touched her from behind and told a dirty joke while they were posing for a 2014 photo. McGrath at the time explained that Bush has been in a wheelchair for about five years “so his arm falls on the lower waist of people with whom he takes pictures”. 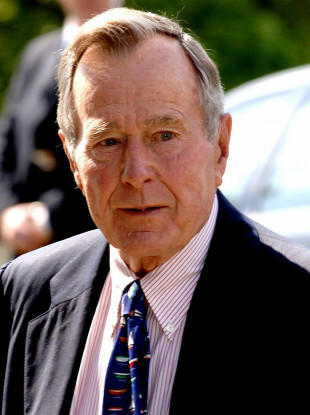 Bush was standing alongside Corrigan for the photo taken in 2003. McGrath’s statement today did not elaborate. Email “George Bush Snr apologises after woman alleges he groped her when she was 16”. Feedback on “George Bush Snr apologises after woman alleges he groped her when she was 16”.